As the helpful men below will tell you, there is no problem that cannot be solved without the proper application of shotguns to people’s faces. Your guy actually looks badass, except for his double-chin. I didn’t know the Normandy could fit through the McDonald’s drive-through. 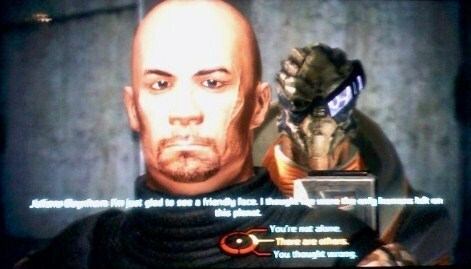 Mass Effect is a triumph of storytelling over gameplay, because the combat system starts as horribly frustrating and painful, until you level up to the point where the combat system is pretty much irrelevant (“Oh, look, enemies – PEW PEW PEW – hey, thanks for killing them, party members!”). However, that aside, Mass Effect’s story, graphics, and presentation in general is not only like a Babylon 5 movie (both in scope and in, well, stealing the plot wholesale – which is fine, B5 did the same thing, space operas aren’t known for their originality), it’s a Babylon 5 movie that’s better than any recent Babylon 5 movie. Between this game, the excellent Assassin’s Creed, and some other game everyone I know is going nuts over and I’m not even having the time to buy yet, tis the season to have no money.